Noted for introducing wood-oven pizzas to Adelaide, Café Brunelli on Rundle Street specialises in serving a wide range of Italian cuisine. 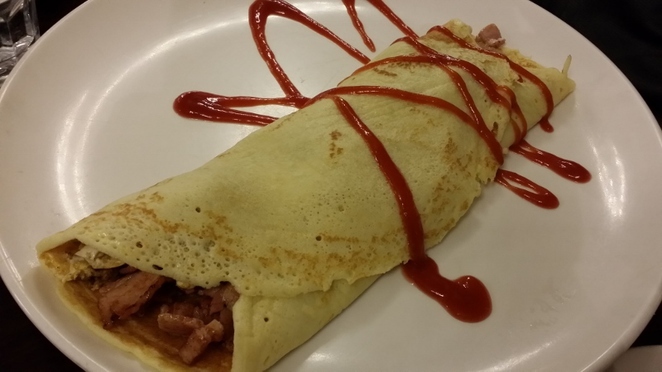 However, we go to Brunelli for their wide selection of savoury and sweet crepes. 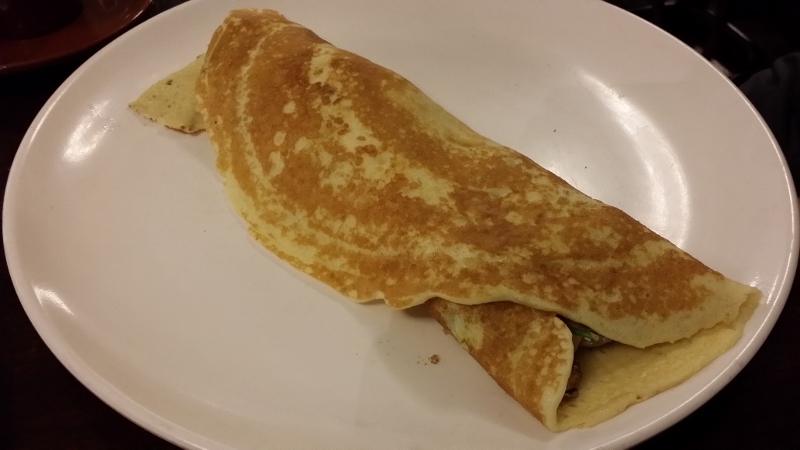 Brunelli's crepes are our favourite dishes from the restaurant because they are so light and fluffy. A dish that we frequently order is the Bacon & Egg Breakfast Crepe which, despite what its name suggests, is available all day. The crisp, smoky bacon was wonderfully set off by the soft eggs and the drizzling of tomato sauce helped to complete the dish. Another crepe that we enjoyed was the Mushroom & Spinach Sizzle. The earthy mushrooms were a perfect partner to the spinach and as with the Bacon & Breakfast Crepe, the eggs were also soft and fluffy. It normally comes with ricotta cheese but we ordered the dish without it as my father does not like the taste of the cheese. To complete your meal, you can choose something sweet from their range of sweet crepes or dessert pizzas. We went with their Coco Choc Banarama crepe, which had a filling of caramelised bananas (that was not too sweet) wonderfully complemented by the chocolate sauce, coconut and shards of dark chocolate. The clean taste of the vanilla gelato and whipped cream which accompanied the crepe provided a balance to the rich flavour of the chocolate and banana. In addition to the Italian cuisine on their menu, Café Brunelli also has a wide selection of cakes, chocolates and pastries that can be viewed from the display at the front of the store. Café Brunelli is very popular with the locals and there was a fairly large crowd when we arrived. The service was pretty good and we didn't have to wait too long for our food to be served. We were able to find free parking opposite the restaurant easily because Brunelli is located away from the 'restaurant end' of Rundle Street. We enjoyed 25% off our total bill by using a voucher from Entertainment Book .